The 2nd District is the smallest district of Paris. 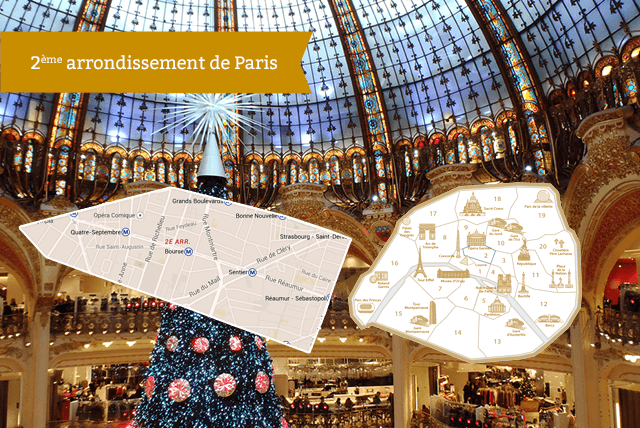 It is located in the heart of the city between the 1st, 3rd, 9th and 10th district of Paris. Gaillon Quarter (5th district of Paris); Vivienne district (6th district of Paris); Mail district (7th district of Paris); Bonne Nouvelle district (8th district of Paris). The 2nd district of Paris is the product of the extension of Paris the fifteenth and sixteenth centuries. The first urban settlements date back from the fourteenth century. Thus, the wall of Charles V (1371 - 1380) was already extended to the rue d'Aboukir. In the sixteenth century, the city extends to the current level of the Grands Boulevards, Louis XIII enclosure (1617-1643). The main buildings are now the old seats of the Exchange and the National Library of France (BNF) - Site Richelieu / Louvois.